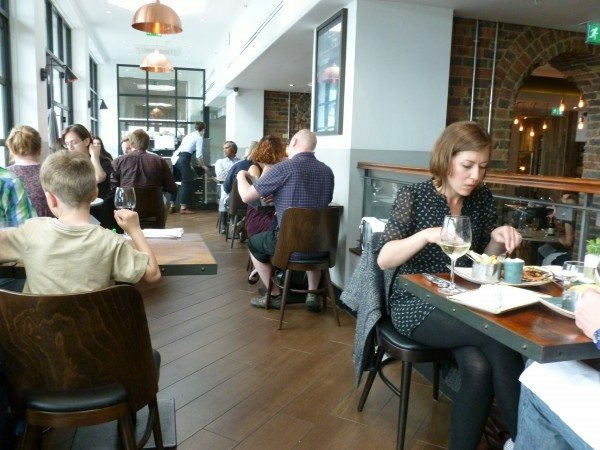 When out of Brighton friends come to town they always want to eat “somewhere on the seafront.” They imagine the promenade is backed by gourmet restaurants, bistros and bars. But in reality, unless you want to sup from a polystyrene tray and sip from a polystyrene cup, there’s not as much choice in the area you might expect. Some of Brighton’s greatest foodie finds are tucked away in the unlikeliest of places. 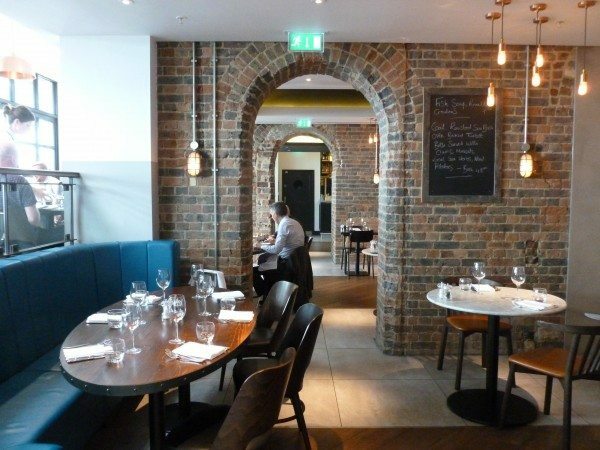 So, the Salt Room, tucked under the wing of the Metropole hotel overlooking the skeletal remains of the West Pier, is a much needed addition to the seafront dining scene. Banish all images of the plush of the hotel’s former lounge bar and think instead a series of brick arches, mirroring those on the front, and wood planked walls hung with framed blueprints of the now decaying pier. 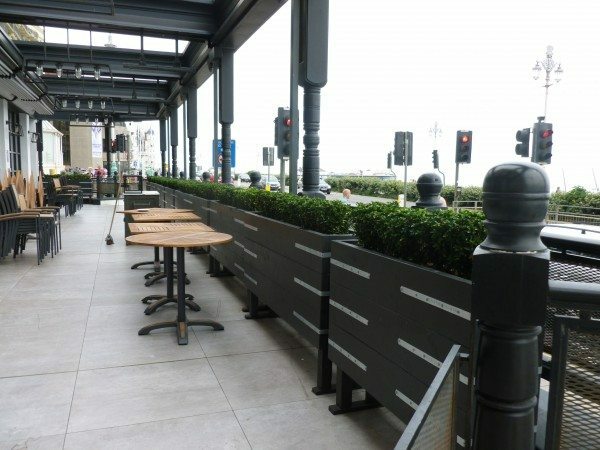 We’d been hoping to sit out front on the newly opened wide seafront terrace, in the slim shadow of the new steel observation tower, but the great British summer prevailed. Instead we watch darkening skies and stormy seas from behind the expansive glass fronted façade. With this to ponder, we peruse a wine list peppered (excuse the condimenty verb) with “salty whites from coastal vineyards” and “those with incredible minerality from deep rooted vines.” I’m not so sure the association of salt with wine is that enticing, but I order a wonderfully named Sicilian Sauvignon Blanc “Uvva di Mare” or “sigh of the sea,” while my dining companion scours the cocktail menu in search of a “sailor’s tipple” with which to wash away her hangover. She hovers over the Sea Crusta, a citrus Vodka concoction which ought to do the job but in the end she plumps for a glass of house red and turns her befuddled brain to the menu. Thankfully, given her condition, it’s set and straightforward in its simplicity. For starters we choose from fish soup, salmon or mackerel. 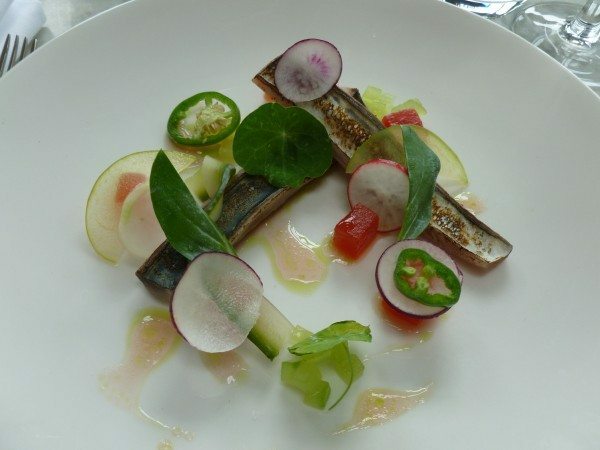 I opt for the mackerel which, when it arrives, is cut into thick chip shaped slabs, which have been marinated in elderflower ceviche and is served with wafer thin slices of radish, melon and cucumber. Slightly hungover diner number 2 goes for apple cured salmon marinated in green tea. Both are appositely salty and sea infused. 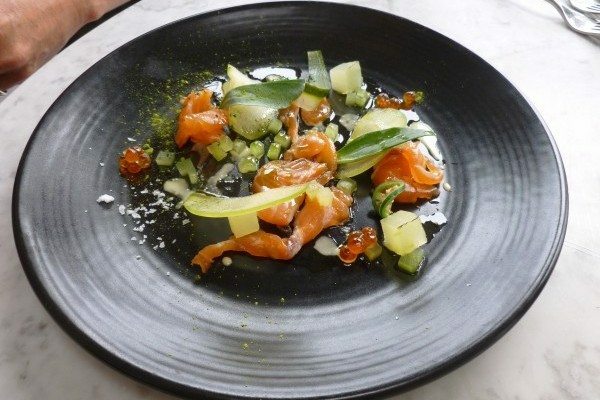 The Salt Room is the better-positioned sibling of one the newest rising stars on Brighton’s culinary scene, The Coal Shed. But where the latter has gained its stellar reputation as ‘a gourmet steak and seafood restaurant,’ the Salt Room reverses the equation and offers seafood ahead of but alongside steak. 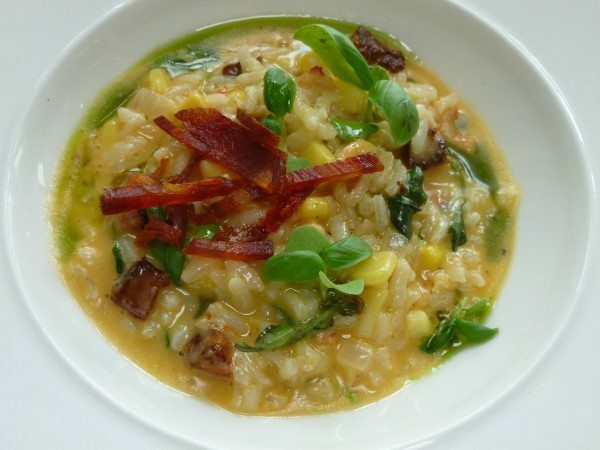 So, while I’m intrigued by the hangar steak served with gentleman’s relish, a dish suggestive of the surrounding Victorian seafront hotels, I opt instead for a risotto of crayfish, sweetcorn, chorizo and basil. 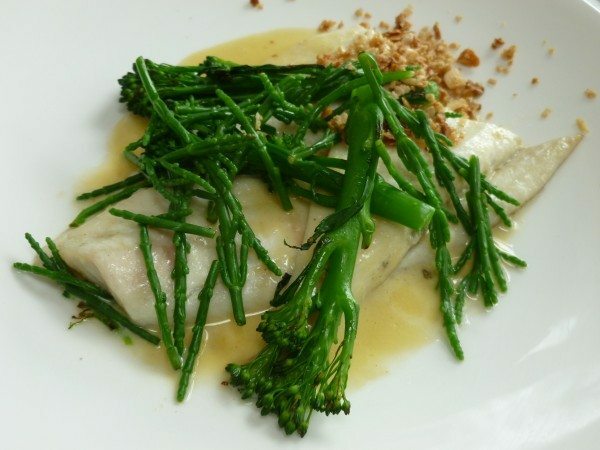 My friend orders the plaice with broccoli, bathed in a delicate oyster veloute with a shingly sprinkling of crushed almonds. My risotto oozes flavors more redolent of the Mediterranean than the English channel which, given the prancing white horses we look out at, is a blessing. I walked past Salt Room at the weekend and it was full to bursting. The restaurant seats 86 with space for another 55 on the terrace. On Tuesday lunchtime it’s quieter but a steady surge of diners blow in off the seafront. The deserts too appear to have been have been plucked from the promenade but given the statutory Salt Room twist. 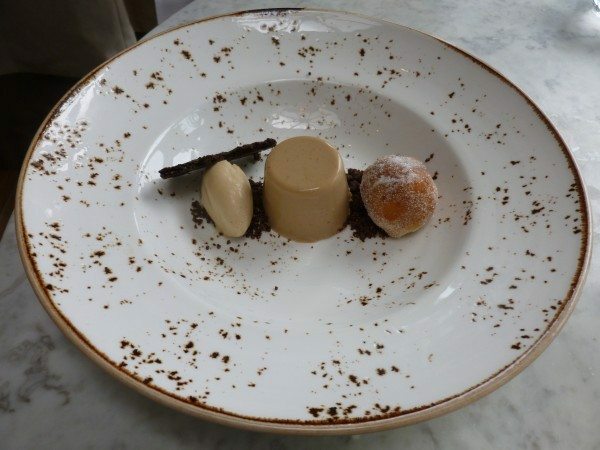 My companion is not quite sure what to expect, when she plumps for coffee and doughnuts, but it’s not the deliciously light warm just fried ball of dough, served with a coffee panna cotta and a dollop of coffee ice cream. 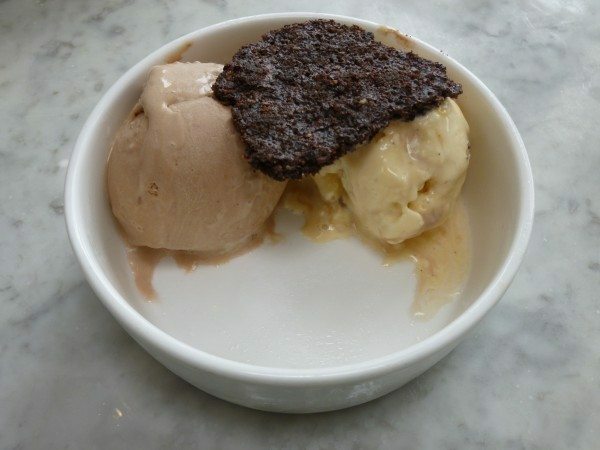 My scoops of homemade chocolate and fudge ice creams eschew cornets in favor of crisp chocolate biscuit water. Both are delicious. The Salt Room is just what Brighton needed on this strip of coastal highway. A restaurant serving reasonably priced (two courses £15 and 3 courses £17.500) fresh seafood and grilled meat, with uninterrupted views of the sea. The next time out of town friends visit and want to eat “somewhere on the seafront,” I know where I’ll take them.